This time of year is so tricky because summer is beginning to wind down, the back-to-school hustle has begun and new fall styles are hitting stores…but most places aren’t yet experiencing significantly cooler weather. I was chatting with a reader earlier this week about how difficult it is when you want to dress for one season, but your reality is something different. So today I’m highlighting two new looks & sharing my styling hacks for how to handle this awkward in-between phase by making just a few easy changes. All the pieces I’m wearing here are under $40 + you can get an extra 30% off your online order (today only!) with code SWEET. Look for breezy blouses in pretty jewel-tones or rich florals that you can wear both now & later. Even though it’s long-sleeved, this crinkled gauze tunic is so light and airy + the black floral pattern makes it ideal for transitioning into the next season. I’d also wear this top untucked with white denim & lace-up flats. This is a simple way to take any outfit from summer to fall & these are both versatile footwear options because they work just as well with denim as they do with most skirts & dresses. These open-toed mules & these peep-toe booties are ideal for autumn & are on sale now! I have an impressive number of skinny jeans, so if I’m going to add another pair to my closet, it needs to be a style that is different from the others I already own. The scoop pockets on this pair create such a flattering fit & give them a cool modern feel. These have more stretch to them than my Rockstar’s from last year & I found that they stretched a bit throughout the day, so I recommend going down a size if you prefer a really snug fit. This is a great example of how to stretch your warm-weather wardrobe. 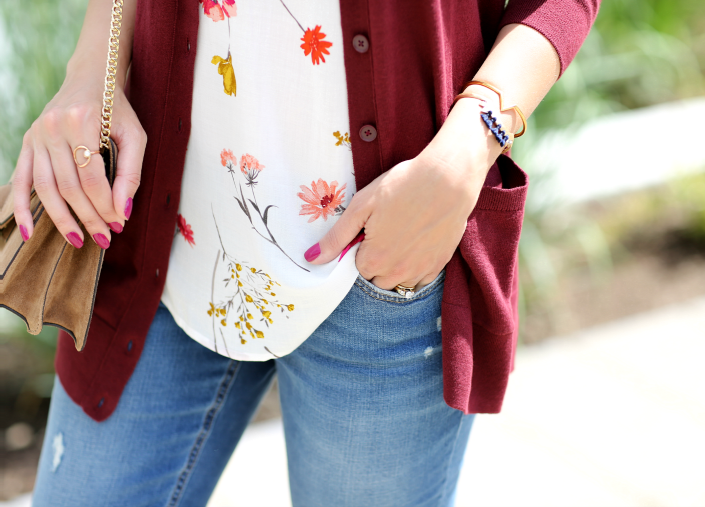 Even though this floral print tank is light & summery, when paired with a rich autumn-hued cardigan, it instantly gives it a fall-ready feel. Other great pairings to try are a white lace top with cognac culottes or a sleeveless dress with a printed scarf. Even though you may know your body type & personal preferences, it’s good to step outside your comfort zone every now & then. When it comes to denim, I tend to stick with skinnies 99% of the time – but, I was pleasantly surprised by how much I loved the other styles I tried on. These flared jeans have an ultra-slimming, leg-lengthening effect and these boyfriend jeans are such a comfortable, relaxed fit without being overwhelmingly baggy. 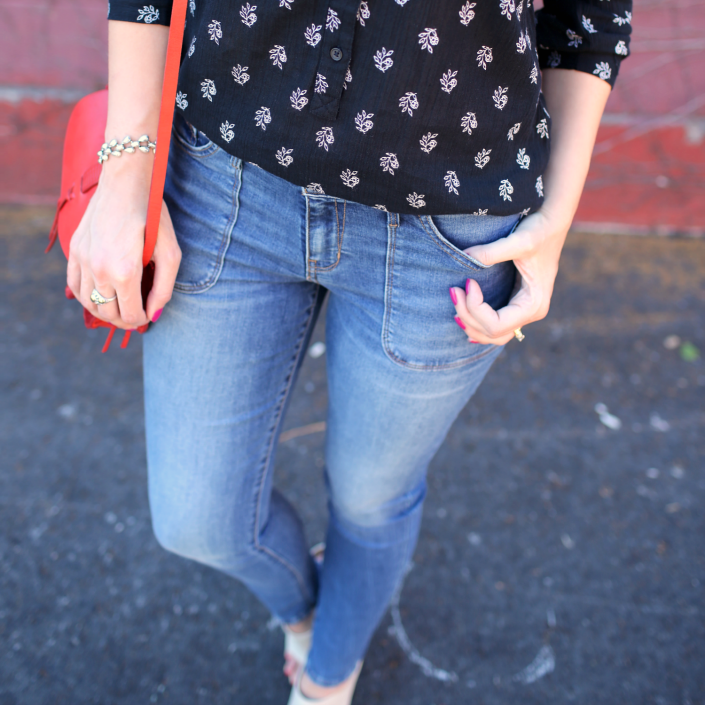 I found that both styles ran big – I went down a size in the flares & down two sizes in the boyfriend jeans. These also have less give to them than the Rockstar’s, so they won’t stretch out as much with wear.